Raul Rhodas, 24, a Honduran resident of Duck Run in the Spanish Lookout area, Cayo District, died after his motorcycle collided with a black cow while he was travelling home to Duck Run after a day of work in Spanish Lookout, just before 7:00 Saturday night. 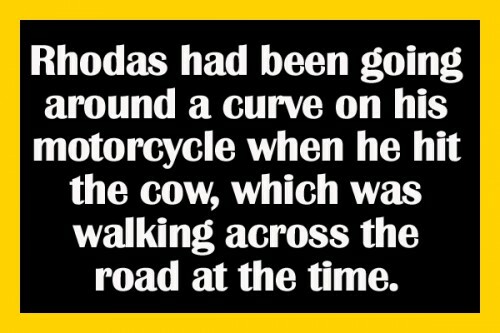 Rhodas had been going around a curve on his motorcycle when he hit the cow, which was walking across the road at the time. Rhodas was hurled about 35 feet away from his motorcycle and onto the road, and suffered extensive head and body injuries as a result. The cow which was hit, on the other hand, received only minor injuries. Rhodas was rushed to the Belmopan Hospital, after which he was rushed to the Karl Heusner Memorial Hospital in Belize City, where he died about 10:00 yesterday morning, after fighting for his life in the intensive care unit. Police reported that they received an account of what happened from Bernhard Penner, 34, a Mennonite farmer of Duck Lane, Spanish Lookout, Cayo District. Penner told them that at about 7:00 Saturday evening, he was travelling to his farm, in the Green Hills area of Spanish Lookout, when, upon passing the junction of the road that leads to the Aguacate Lagoon, from about 200 hundred yards away, he noticed a black cow standing on the left side of the road. Upon seeing the cow, he slowed down and passed the cow, Penner told police. Seconds later, Penner said, a motorcycle coming in the opposite direction, travelling at about 50 miles per hour, passed him. According to Penner, he was about 100 yards from the cow when he heard a loud bang and noticed that the lights of the motorcycle went out. Penner said that he immediately turned around and drove back to where he had seen the cow. Upon his arrival at the spot, he noticed that a male Hispanic man who was riding the motorcycle was on the ground bleeding from injuries to his head. He immediately called the ambulance and the police.